Had a customer with a configuration issue with the WordPress site. The original developer had the end users email as the return email address. Contact Form 7 prefer keeping this email address on the same domain, and adding a “Reply to” in the additional headers area. The following link solved this issue for me. Which lead me to here. Had a customer who wanted to update an Outlook contact who is part of a group email address. When we deleted the user in the group the group was gone. We looked at was to recover. The big suggestion was to recover deleted items. We went into deleted items but the group wasn’t there. They are running an internal Exchange 2012. We looked at there OWA to try to recover. The following article helps me solve this. It was the least technical link, but solved my issue. The big issue is when you delete a group it goes into the deleted items with the date the group was started and not the date the group was deleted. I went back into the deleted items and at the bottom there was a link to see more and the item I was looking for was at the bottom. 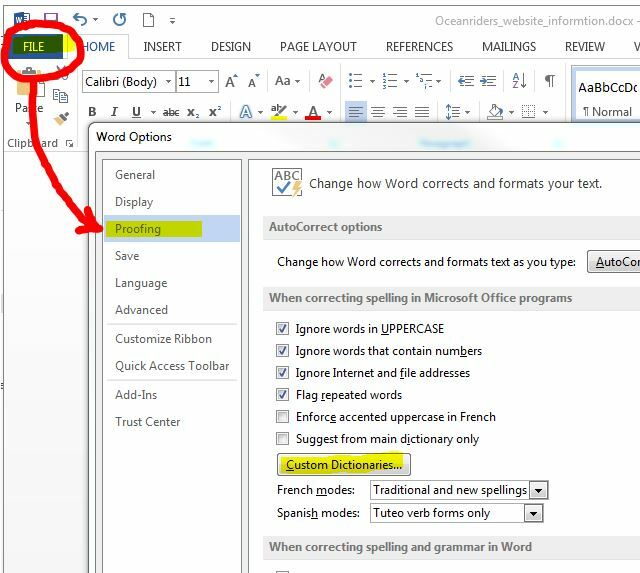 Had a customer who was having an issue adding a custom dictionary to the Microsoft Word. I found the following article that walked me through what to do. Start by clicking File > Options > Proofing. We unchecked the RoamingCustom.dic. Clicked “Add”, and gave this new dictionary a name. Word asked if we were sure we wanted to add this new one. We clicked okay, and everything was working again.